Blake Griffin of the Los Angeles Clippers and LeBron James of the Miamia Heat laugh during the first half of the NBA All-Star basketball game Sunday, Feb. 17, 2013. The conventional wisdom is that LeBron James will remain in Miami or return home to Cleveland. Neither would maximize his chances of winning a championship — but Cleveland, at least, is on an upward trajectory. In Miami, James runs the risk of staying too long with a team in decline. The Heat won 54 games last year in a historically soft Eastern Conference and were dismantled by San Antonio in the NBA Finals. As if the Spurs left any doubt, a team with 54-win talent is rarely good enough to win a championship. Since the introduction of the three-point shot in 1979-80,1 just one of 22 teams to finish with 54 regular-season wins has won the championship that season. I’m not cherry-picking data to make the Heat’s case look bad. We can expand the sample to include all teams that won between 52 and 56 regular-season games. There have been 102 such teams — and only three of them won the NBA title. If James really wants to get to that 60-win threshold, he’d be better off exploring teams aside from his reported favorites, such as the Chicago Bulls, Houston Rockets, Dallas Mavericks, Phoenix Suns, Atlanta Hawks, New York Knicks, Los Angeles Lakers and Los Angeles Clippers. When I placed James on the roster and ran projections for those teams, all but one finished ahead of both Miami and Cleveland. To make the projections, I used a metric called Statistical Plus/Minus (SPM), which was originally developed by my colleague Neil Paine. 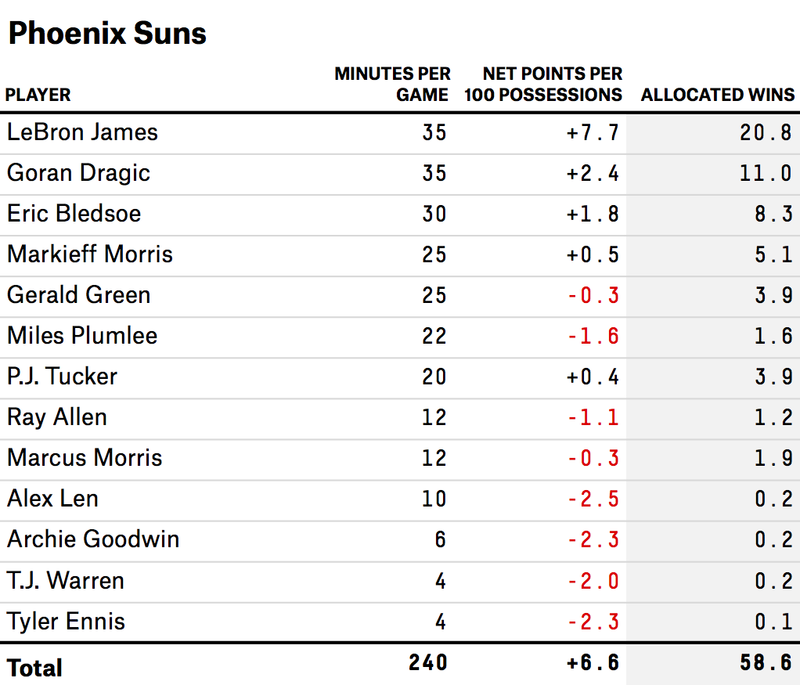 (SPM is not quite the same thing as NBA Real Plus Minus, though the systems are related.) SPM measures a player’s value in points per game (more precisely, points per 100 possessions3) relative to the league average. For instance, a player with an SPM of +4 (like the Bulls’ Joakim Noah) produces a net of four extra points for his team per 100 possessions. James is in the range of +8. Negative SPMs indicate below-average players. SPM has a good track record when it comes to predicting how teams will be affected by roster changes. But I’m hoping not to get sidetracked into a debate about which is the best “all-in-one” NBA metric.4 In this case my choice is pragmatic: Whereas some metrics like win shares value the very best NBA players as worth 15 to 20 wins per season, others like PER estimate that they’re worth 25 to 30 wins per season. SPM, which can also be translated into win totals, comes down somewhere in the middle, and puts James in the low 20s. We also need some way to project a player’s SPM for next season, so I’m using a variant on another Neil Paine invention, the Simple Projection System. Like Neil’s system, my version uses data from the past three NBA seasons. The only variables it looks at are SPM and minutes played. But it includes a slightly more sophisticated handling of mean-reversion5 and player aging.6 There’s also a separate routine to handle rookies, whom I’ve projected on the basis of their draft position and age.7 You might call my variant the Pretty Simple Projection System (PSPS). Let’s put some of that methodology to use. I’ve projected seasons for the 10 teams that, at one point or another, were rumored to have a chance at landing James. We’ll start with the worst and move toward the best. Ranking at the bottom are the Los Angeles Lakers. The system projects that the Lakers would win only 42 games even with James on the roster. The problem is that between age and injuries, Kobe Bryant and Pau Gasol may be no better than average NBA players — and any scenario that would allow the Lakers to sign James would require them to absolutely gut their depth. James is the only top-tier free agent the team signs this summer, other than its own free agents. So the Lakers can re-sign Pau Gasol, for instance, if the salary numbers are at all realistic. But they can’t also sign Carmelo Anthony or someone to pair with James. Rosters must be at least vaguely plausible under the salary cap and other contractual rules. Some cases will be bigger stretches than others. (For the Lakers, both James and Gasol would probably have to accept less than they might make elsewhere.) But they’re reasonable best-case scenarios or slightly better than that. In some cases, I’ll specify players who I assume will have to be traded to clear cap room for James. Every team that gets James also gets Ray Allen for “free.” That is to say, it signs Allen for the minimum salary or in some other way that doesn’t require it to sacrifice its options. There are reports that Allen will follow James wherever he goes. 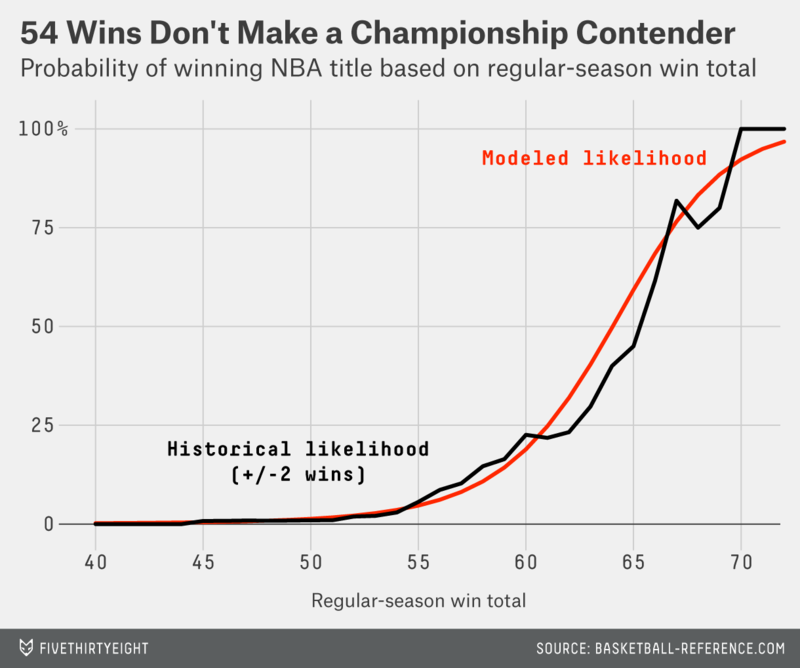 Like a lot of reports in the NBA’s silly season, they may turn out to be false. But even if Allen doesn’t follow James, another veteran like Mike Miller might. Allen represents a team’s “LeBron Dividend” — the one or two championship-seeking veterans who might join James for slightly below their market rate in order to have a shot at a ring. Once we allocate a team’s minutes, we can estimate its projected scoring margin by summing each player’s SPM projection. 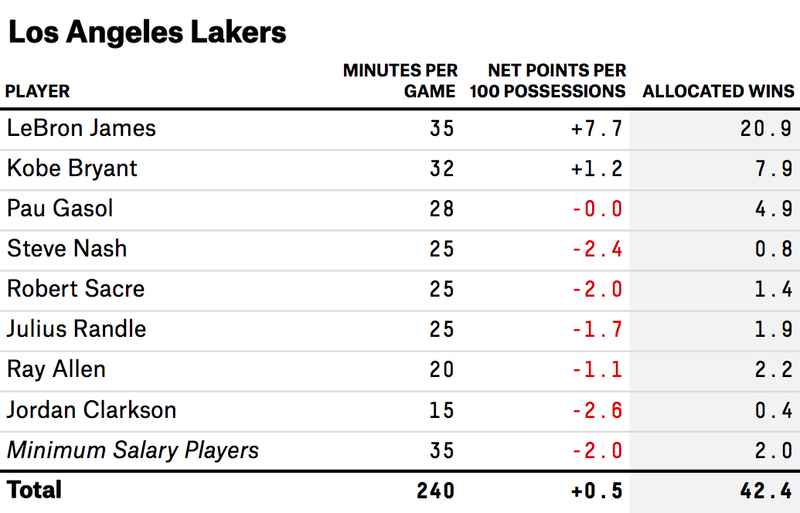 The Lakers, for instance — even with James — would be projected to outscore their opponents by only 0.5 points per game. That translates to a 42-40 record, using a Pythagorean projection. Here are some benchmarks to keep in mind: A team that played James 35 minutes a game and filled out the rest of the roster with replacement-level players would have a projected record of 33-49. And a team that had James plus 11 league-average players would have a record of 56-26. That’s why James wouldn’t give up much if he left Miami, which won 54 games last season. The rest of the Heat’s players have regressed to the point where they’re league-average without James, or perhaps slightly below average — and they probably aren’t going to get any better. The controversial case is point guard Mario Chalmers, whom I’ve left off the roster. Chalmers played poorly in the playoffs and the Heat would have very limited money to offer him after stretching as much as it can to re-sign the Big Three. But SPM hates the alternative point guard, Norris Cole, and it’s inherently pessimistic about what any rookie (Shabazz Napier included) will do in his first season. 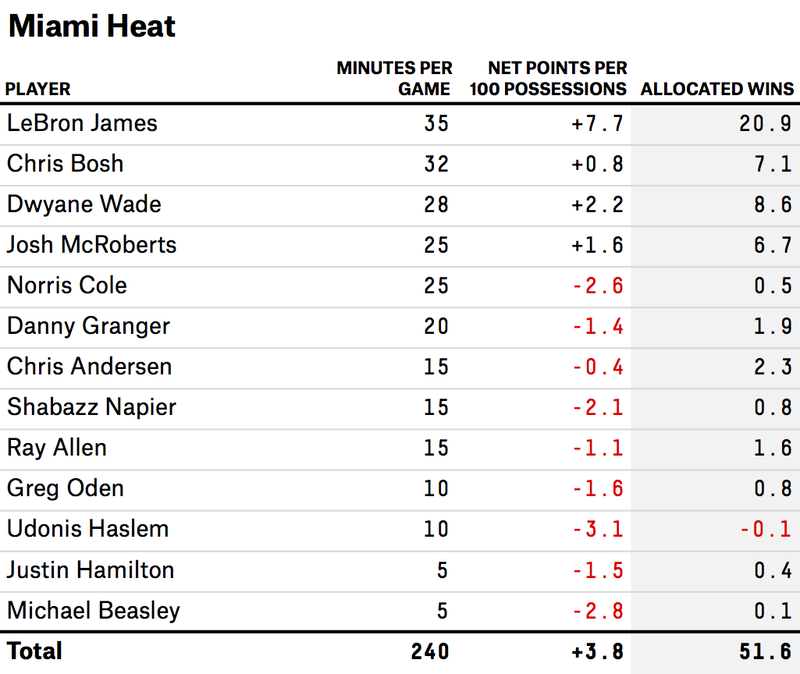 If you replaced Cole’s minutes with Chalmers’s, the Heat’s projection would improve to 56 wins. Still, Miami would be somewhere in the vicinity of where it was last season. What the Heat really needed was to add another star talent, especially to address its deficiency at the point. For instance, if Miami had snagged Kyle Lowry — and somehow also re-signed the Big Three — it would project to 60-plus wins. The wild-card scenario would involve the Heat retaining James but parting ways with Bosh or Wade. There are some theoretically intriguing possibilities that build a team around James, Carmelo Anthony, a league-average point guard and some complementary role players. But ultimately James would maximize his championship potential by surrounding himself with players who are underpaid relative to the basketball value they produce. Might he find them in Cleveland? Perhaps, but the Cavs’ projection is the same as the Heat’s: 52-30. The Cavaliers won only 33 games last season, so a 19-win improvement is sizable. A little bit of that comes from projected improvement from young players like Kyrie Irving — although the Cavs also have a few subtractions, like Jarrett Jack and Luol Deng. At least in Cleveland it’s possible to conjure any number of upside scenarios. Reports have linked Minnesota’s Kevin Love to the Cavs, for instance. With a number of caveats,11 trading Andrew Wiggins and Anderson Varejao (and some draft picks) for Love would make the Cavs a 60-plus-win team with James on the roster. Or the Cavs could wait for Wiggins, Irving and Tristan Thompson to develop further. The Mavs have probably gotten over James, having made an offer to Chandler Parsons instead (Parsons is a restricted free agent, so the Rockets will have the right to match). And our projections aren’t all that optimistic about them. Dirk Nowitzki is finally due for some age-reversion. 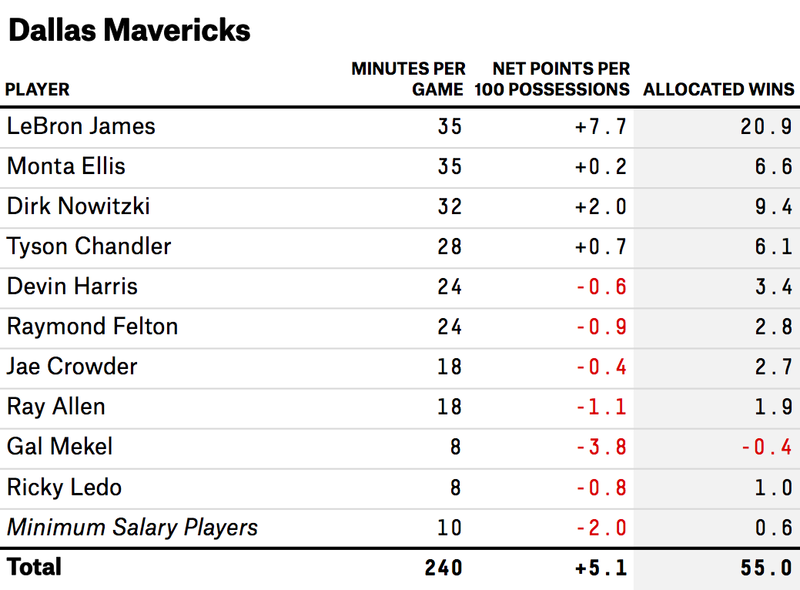 Monta Ellis has never been an advanced-stats poster boy. The Mavericks might get poor point-guard play from Ray Felton, and I’m assuming the team would have to salary-dump Brendan Wright, and give up on re-signing Vince Carter and Shawn Marion, in order to clear room for James. With all those issues, they’d still project to a 55-27 record next season with James. This is almost certainly not going to happen. The Knicks would have to find takers for Amar’e Stoudemire and Andrea Bargnani. Even under this miracle scenario, I’m assuming that they’d lose Iman Shumpert and Tim Hardaway, Jr., in order to facilitate salary-dump deals. I have them relying on a lot of playing time from second-round draft picks and other dubious alternatives like Lamar Odom. 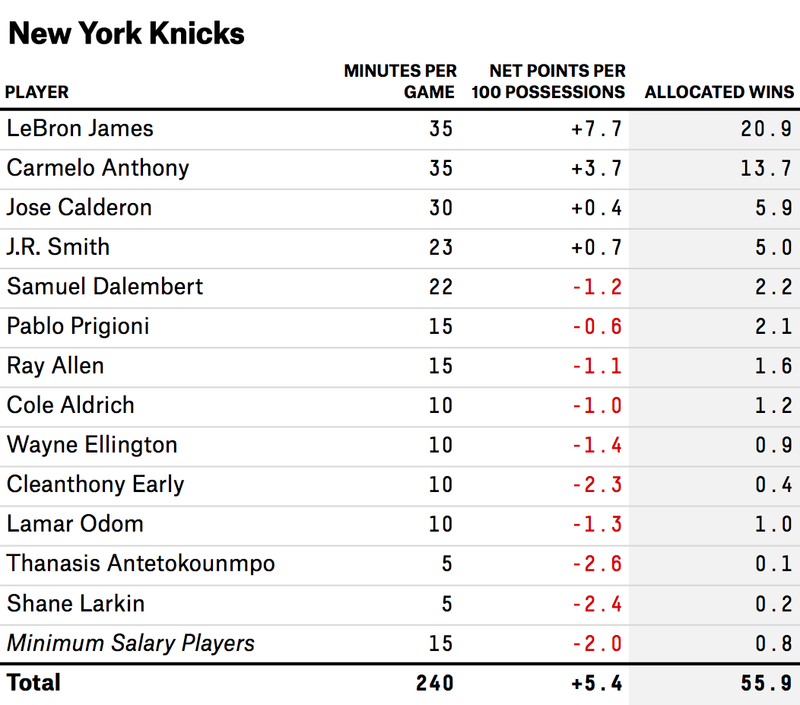 Even so, the Knicks project to a 56-26 record with an Anthony/James pairing and an otherwise spartan roster. Don’t take this as an indication of how awesome the Knicks are, but instead as a benchmark for how little of a draw Miami’s incumbent status really is for James. As I mentioned earlier, a team of league-average players plus James would project to a 56-26 record; Miami is about a league-average team without James, but so are the Knicks. It’s not a high bar to clear. Jeff Hornacek somehow got 48 wins out of a roster that was expected to lose enough to be granted a lottery pick. There’s the potential for some mean-reversion in Phoenix, but that’s much less of a concern for a young club. The Suns have a lot of underpaid players and could potentially add another piece next year in addition to James. As Lowe wrote, if James were making a decision strictly on the basis of getting the max salary on a title contender, the Suns would be an excellent option. The starting five would be very good, depending on Al Horford’s health. There isn’t a lot of depth in Atlanta, but Miami and Cleveland don’t have much depth either. It might seem surprising that the Bulls project no better than the Suns or the Hawks — not that 59 wins is anything to sneeze at. But I’m assuming that to sign James, the Bulls would have to amnesty Carlos Boozer and find a taker for Mike Dunleavy. Granted, Boozer and Dunleavy are not better than league-average players at this point in their careers. But they also aren’t total zeroes; they combined for 10 win shares last season. The win-shares baseline is too generous; but when James gets added to an already talented roster, he’s taking playing time from some semi-respectable alternatives instead of some Bargnanis. 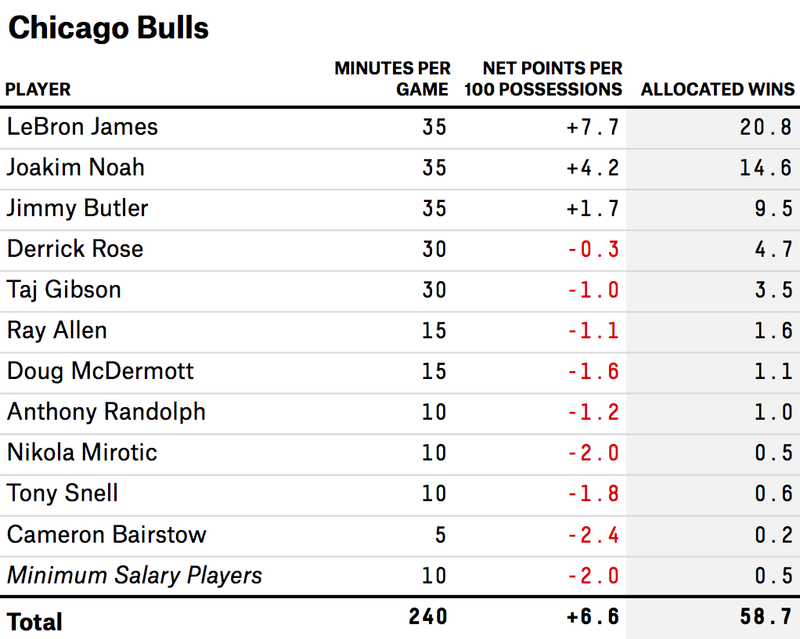 The other issue is Derrick Rose, who projects as only a league-average player. The problem is not just that Rose has played only 10 games in the past two seasons — he stunk when he did play last year. Still (since we’re indulging in so many hypotheticals) the Bulls would project to a 65-17 record if they both signed James and Rose performed at his 2011-12 level. James’s final alternative would be to create a sequel to the Big Three with either the Clippers or the Rockets. They’re terrific options if the cap mechanics work. A LeBronful Clips team projects at 66-16 — and the Rockets are even better, at 69-13. The Clippers’ Big Three might be slightly better than the Rockets’, but the Clips would have to gut their roster to keep all three players on board — dumping DeAndre Jordan and Jamal Crawford, and perhaps others. Still, the top-level talent might overwhelm everything else, in the fashion of the 2007-08 Celtics. The talent in Houston would run six players deep, with Chandler Parsons, Patrick Beverley and Terrence Jones aiding and abetting James, James Harden and Dwight Howard. 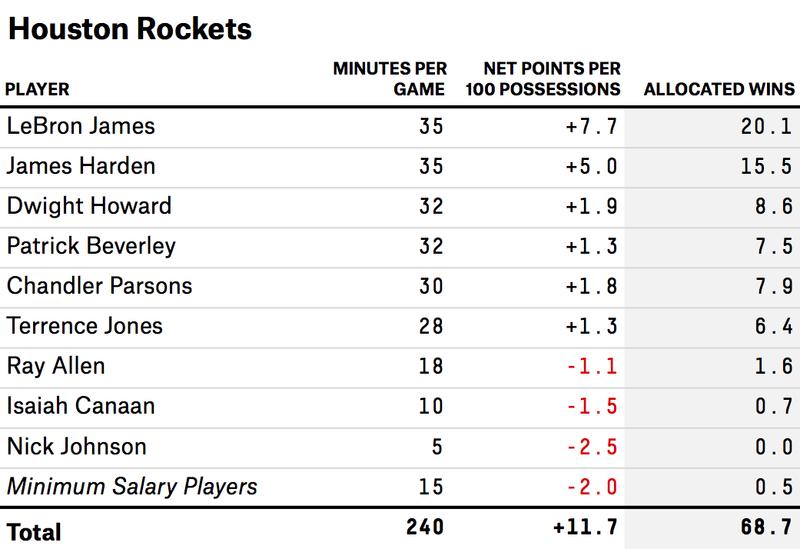 After that, there would be almost no one on the roster — the Rockets would have to dump Omer Asik and Jeremy Lin to make room for James. There’s room for concern about how well James, Harden and Howard would mesh together — something that statistics like SPM may not capture well. But this would be a really, really good problem for Houston General Manager Daryl Morey to have. Even if the Rockets lost Parsons to Dallas as collateral damage and gave his minutes to veteran-minimum players instead, they’d project to 65 wins. Even if you subtracted five more wins for lack of team cohesion, they’d still be better positioned to win a championship than the Heat. But incumbency is a powerful advantage. James may stay in Miami or go back to Cleveland — even if some alternatives might give him a better chance of keeping up with Michael Jordan. I exclude lockout-shortened seasons from these tallies. These estimates are based on a logistic regression analysis. There are about 100 possessions per team in a typical NBA game, so points per 100 possessions is roughly equivalent to points per game. A couple of us at FiveThirtyEight are agnostic enough about the alternatives that we’re thinking about publishing a consensus metric that averages the different rating systems. Simple Projection System reverts players to the league average, whereas my variant reverts players to below the league average and is more suspicious of players who post strong SPMs in limited minutes. Simple Projection System is probably too conservative about adjusting for a player’s age. Holding draft position constant, older players are more “NBA-ready” (better) in their rookie seasons, though the trend reverses itself after a few seasons. 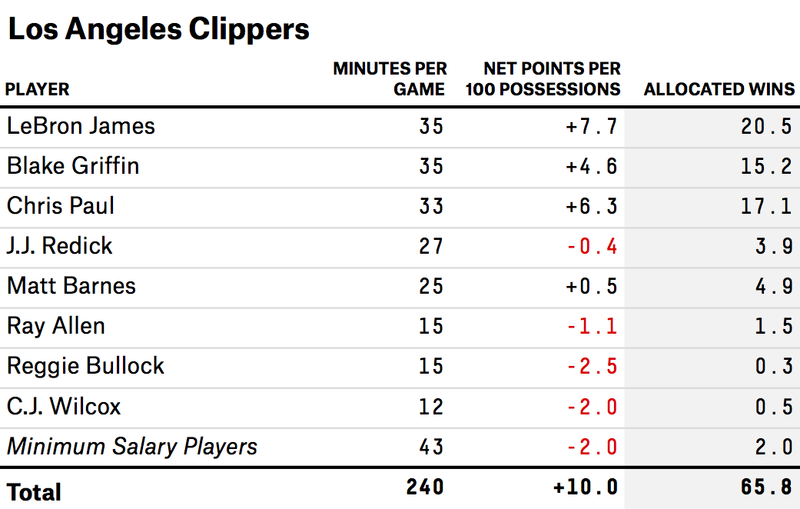 The minutes-per-game figures in this article represent the total number of minutes on a player’s season divided by 82 games — as opposed to the average number of minutes in games that a player participates in. For instance, if Samuel Dalembert averages 30 minutes per game in his first 41 games with the Knicks, then sits out the remaining 41 games due to injury, his minutes would be listed at 15 per game, not 30. 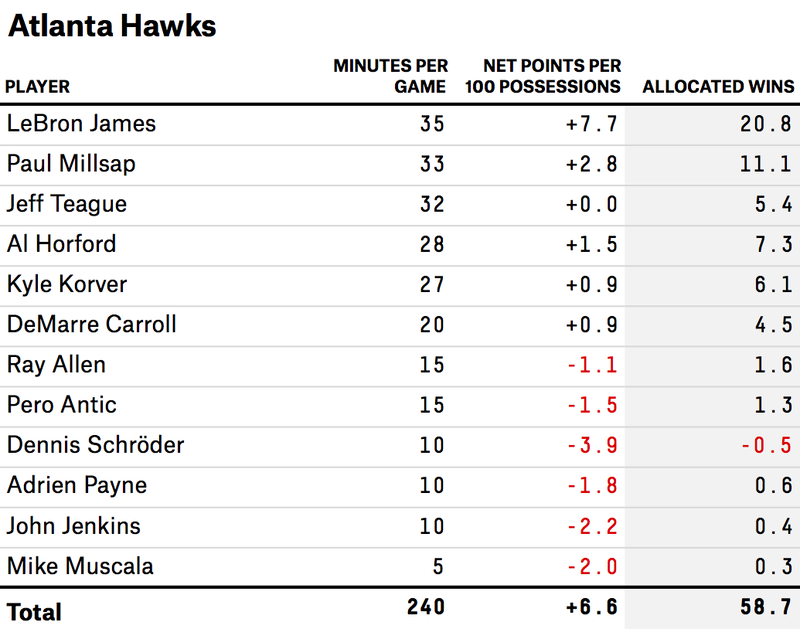 This is why the minutes-played figures may look conservative — I’m building in some buffer for injury. That uses a Pythagorean projection; I use 14 as the pythagorean exponent, as Basketball-Reference.com does. This implies, incidentally, that replacement level in the NBA is not zero wins, as some other systems have it, but somewhere in the range of last year’s Philadelphia 76ers instead. The allocation works by calculating a player’s wins above average based on his SPM projection and the Pythagorean formula, assuming that he was added to a league-average team. Since an average team would win 41 games, I also add 8.2 wins (41 wins divided by five positions) per 48 minutes played to each player so that the sum of player win totals roughly matches the team’s win projection. This produces a number that can be compared to win shares or other NBA metrics that denominate a player’s value in wins. However, the statistic should not be thought of as “wins above replacement.” Instead, it represents wins as compared to a really, really bad player who is even worse than replacement level — you might call it WAABAAB, Wins Above Anthony Bennett And Andrea Bargnani. Another complication is that the wins estimates for individual players will not exactly match the team total. This is principally because of diminishing returns for very good or very bad teams (a team can’t win more than 82 games or fewer than zero). In my system, the team win total has priority: Player win totals are adjusted to match the team figure rather than the other way around. This only has a material impact for extraordinarily strong or poor teams, however. 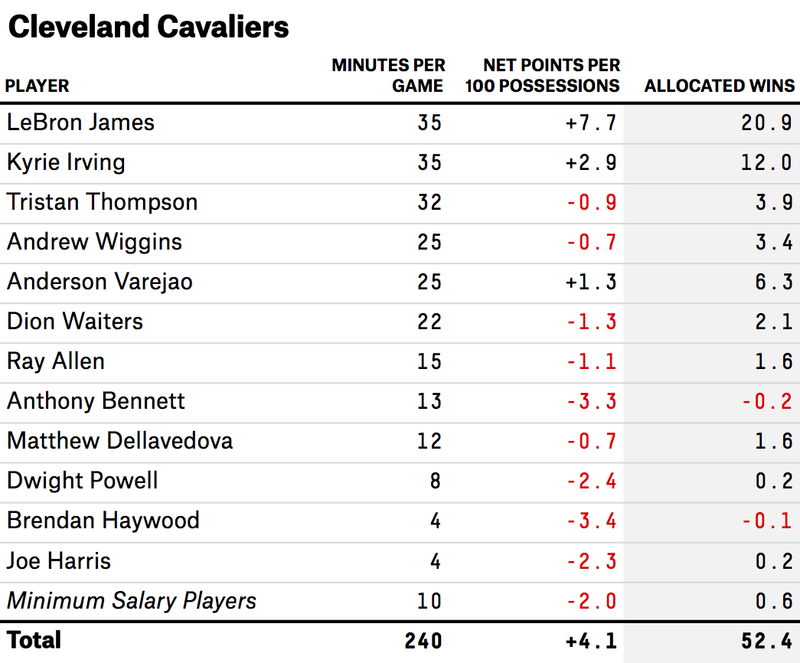 Metrics derived from “box score” stats may be too much in love with Love; it’s not clear whether the salaries would work out; the Cavaliers would lack a true center if they tried this.